If there's one thing we're absolute suckers for, it's amazing packaging. So, the moment we laid our eyes on the brand-new, born-in-San Francisco Bananappeal treats, we were smitten (gorgeous, no?). Then, of course, we devoured the snack itself, and now we're pretty much head over heels. 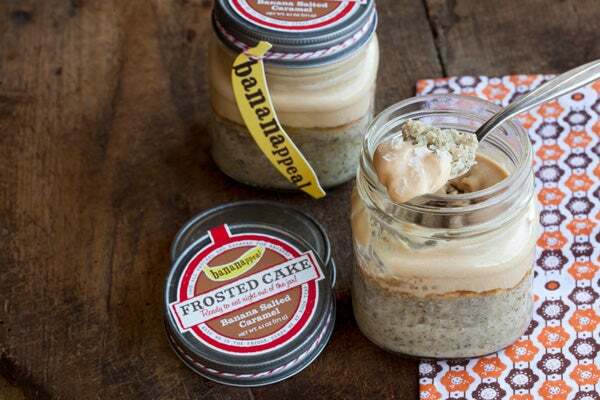 The brainchild of former San Franciscan Courtney Dougherty, who has recently decamped for Denver, Bananappeal is just what it describes itself as: "An incredible, delicious, all-natural, ready-to-eat, banana-based dessert, baked and sold in glass jars!" The snacks come in either 4- or 8-ounce Mason jars and are split into two categories: frosted banana cakes or cheesecakes. The flavors are plentiful and delectable: Banana Salted Caramel, Banana Peanut Butter, Banana Gingersnap, Banana Tiramisu, and the list goes on. Then, of course, it's tucked into a country-cool Mason jar, slapped with some rad logos, and tied with a charming piece of candy-cane-striped twine. "I knew that I wanted to differentiate myself and so I decided to focus on one ingredient. Always a banana-lover, I had felt that bananas never received the credit they deserved in the dessert arena beyond basic banana bread," explains Dougherty, who worked as a pastry chef in New York and Chicago and with Tyler Florence in San Francisco. "I wanted to show people that the banana desserts I made could stand up to other high-quality, fine-dining desserts." And that they definitely do. So, how can you get your paws (and lips) on them? GiltTaste is hawking the sweet treats, just in time for Valentine's Day, later this week, and Williams-Sonoma will be doing the same starting March 15. Foodie jarheads, mark your calendars.